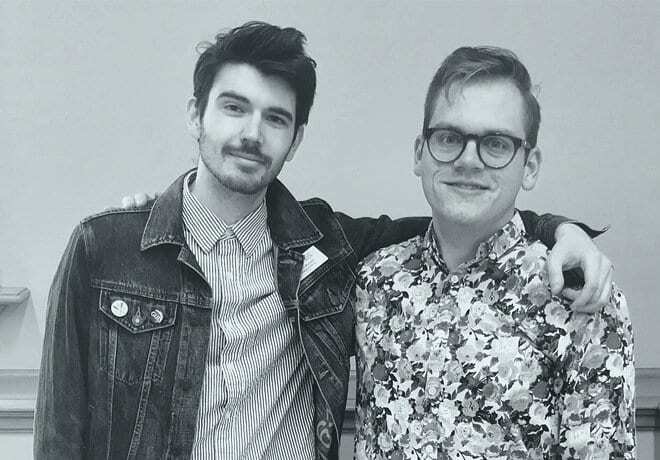 In less than a week, Edmonton authors Jason Purcell and Matthew Stepanic have fundraised more than $13,500 toward opening Glass Bookshop, a bookstore, wine bar, and community space dedicated to promoting diverse voices. The campaign goal, which is $25,000, will supplement their small-business financing. Potential locations are being scouted, with the store expected to open in November 2019. Although the two do not have direct retail ownership experience, both are invested in the city’s cultural community. Stepanic is a freelance writer and editor, and the 2019 writer-in-residence at the Edmonton Public Library. He is editor of the literary journal Glass Buffalo, and the poetry editor for Eighteen Bridges. He’s also the co-author of the collaborative novel Project Compass (Monto Books, 2017), and the author of Relying on that Body (Glass Buffalo Publishing, 2018), a chapbook of poetry inspired by RuPaul’s Drag Race. Purcell, who has more than 10 years bookselling experience, is currently programs officer at the Canadian Literature Centre, and serves alongside Stepanic as interviews editor at Glass Buffalo, circulation coordinator for Eighteen Bridges, and co-editor of Ten Canadian Writers in Context (UAP, 2016). His first chapbook, A Place More Hospitable, will be published this spring by Anstruther Press. How did the idea come about? Did you feel there’s currently a lack of this type of mixed space in Edmonton? Stepanic: Jason and I are both heavily involved in the literary and arts community in Edmonton, and we’ve both always dreamed of owning a bookshop. We’ve been friends for over six years, and although we always bandied the idea about, it was only a year ago that we decided to put a serious effort into making this dream a reality. We realized that our skills and interests complement each other perfectly and we bring different strengths to what it takes to run a local business of this nature. With only one local, independent bookshop that sells new books, we definitely believe the city’s book lovers could support a new space. We also envision Glass Bookshop as a community space that regularly hosts literary events, book launches, and conversations, and we’d heard from event and festival organizers that a space like this was much-needed. And we believe with the addition of our wine bar, we’ll be able to offer a warm and welcoming atmosphere for all types of events. Are you modelling the store after any other stores/centres, or are there similar ones that you’ve seen? Purcell: In terms of our community mandate and ethic, we have drawn inspiration from Vancouver’s Massy Books. Patricia Massy has done so much in such little time to engage with the community around her store, including a collaboration with Room Magazine called Indigenous Brilliance, where she works with poets Jessica Johns and jaye simpson to dedicate space and time for women, Two-Spirit, and queer Indigenous storytellers to share their work. We think this is such an incredible initiative, and one that we’d like to see exist in Edmonton. We also wanted our bookshop to be thoughtfully designed, and we looked to BOOK/SHOP from the San Francisco Bay area for inspiration. Vivek Shraya – a great supporter of the shop – has described our brand, which was designed by Vikki Wiercinski of Mezzaluna Studio, as having a “strong aesthetic with a queer sensibility,” and I love that. I think a hub of writing and art, particularly one that is safe for queer and IBPOC folks, should be vibrant, to reflect the work that these folks are producing. Since we operate online for the time being, it’s been through our branding and our Indiegogo perks that we’ve been able to play with this aesthetic. We’re particularly thrilled to offer a set of literary postcards illustrated by a queer Edmonton-based Salvadoran artist named Michelle Campos Castillo and by Alberta’s first artist-in-residence Lauren Crazybull, a Blackfoot, Dene artist also based here on Treaty 6 territory. They’ve contributed illustrations of Vivek Shraya, Billy-Ray Belcourt, Larissa Lai, NASRA, Marilyn Dumont, and Mel Hurtig. How big is the proposed space? Stepanic: We’re aiming to officially launch the shop in November 2019, with a soft opening in late October. We’re currently looking at some spaces in the Quarters neighbourhood of downtown Edmonton that would be upwards of 2,600 square feet and allow us to host events of about 100 people. If you don’t achieve your financial goal, are you still in a position to open? Purcell: Yes! We are 100 per cent committed to building this space for arts and book lovers in Edmonton, and are running this crowdfunding campaign to offset small business financing so that we can be in a healthier financial position when we’re open. The Indiegogo campaign is an opportunity to launch the bookshop and its mission, and reward people for their early support with incredible perks from local makers.